Nothing beats the sound of strings reverberating inside one of Charleston’s many churches! Custom Bow Ties by Charleston fashion designer Cooper Ray. We played nothing but pop rock! Get your front row seat! The perfect romantic backdrop to your event! Welcome your guests with the sweet sounds of violin and cello! Strings, the perfect romantic musical backdrop! Give your event a sophisticated touch! The perfect complement to any event! Charleston’s Premier String Ensembles and More! Our goal is simply to provide you with the quality and experience that will ensure the perfect atmosphere for your finest occasions. 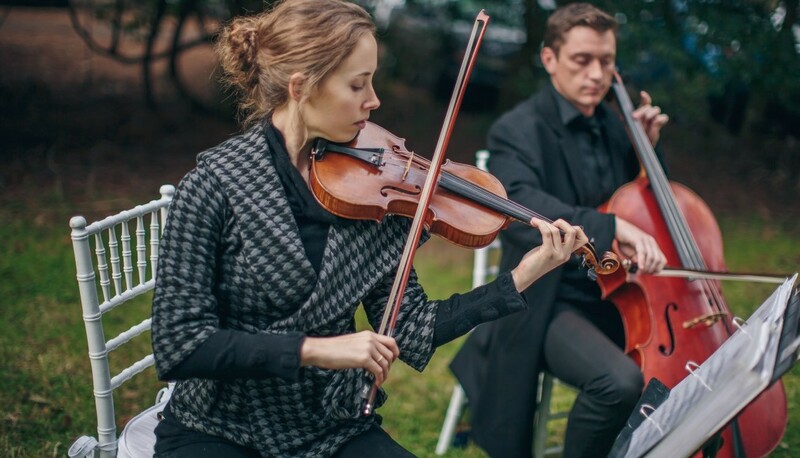 Our string duo, trio and quartet offer the largest and most diverse repertoire of classical, pop, classic rock and jazz in the Southeast and each ensemble is customized to meet your needs. A solo vocalist, trumpet, bagpipe, harp, flute or organ can be added to the mix too, you name it! Check out our Ensemble & Soloist Options to see the range of what we offer, everything from bagpipes, our famous string duo and trio, to our Electric String Quartet. We also offer tried-and-true DJs and Wedding Ceremony Officiants that can be booked on the same contract with our strings. Charleston boasts many of South Carolina's finest classical musicians and performers and we'd like you to meet them! Classical Charleston is a community, not of the everyday gig musician, but of concert-quality performers who embrace the classics yet continue to push the boundries of what can be played on string instruments. We set the bar for Charleston's wedding musicians and corporate event musicians. Read up on our many Maestros! Visit & Like Classical Charleston on Facebook! Listen to our repertoire and sound on our Live Recording List. You'll find classical, jazz, tangos, wedding music, the list goes on.. and if you can't find it, just ask. We hope you enjoy! Classical Charleston © 2019. All Rights Reserved.